What Happened to Death & Taxes? Death & Taxes was one of the strongest decks in Legacy in early 2016. However, in the last 2 years it has declined. Today I have the reasons to why this is the case, and workable solutions to the problem, at least from a Melbourne metagame perspective. Although many have presumed Death & Taxes has been on the decline for 2 last years due to the deck as a whole just not being good anymore, the truthful answer to the question is Death & Taxes has lost a lot of it’s “free” wins that the equipment package generated. Back in 2015 and early 2016, Batterskull was a free win vs. a lot of decks. 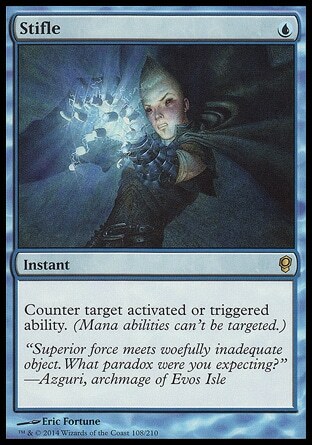 In 2018 it’s more of a hindrance than a good card. 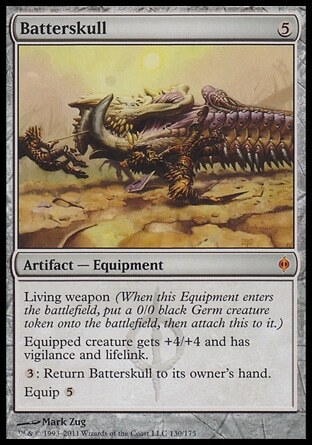 Many Death & Taxes players are clinging to the fact that Batterskull is still a good card in Legacy – but to me, it’s just simply not. Let’s briefly look at the equipment package, Batterskull and a variety of popular matchups currently. 18 months ago, Dragon stompy really couldn’t beat a Batterskull. Nowadays they have Bridges, Chandra, Hazorets and a lot of cards that easily beat Batterskull. 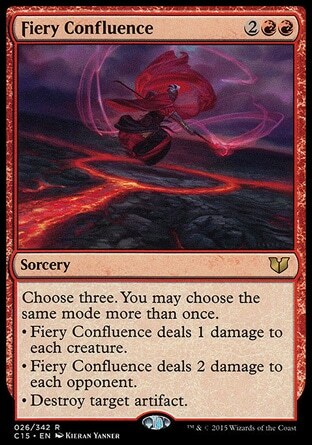 Especially with Abrade and Fiery Confluence now often included. Well, even in 2016 Batterskull wasn’t that good as it used to be. Between Angler and True-Name Batterskull was easily answerable. The average Death & Taxes player response was: “but Batterskull races TNN!” Yes it does… However no goodDdelver player attacks in with a True-Name, they typically wait until they get a Delver or Deathrite, to drain/attack above the Batterskull. The TNN just stops the Batterskull attacking into it. Slightly better against Angler but it’s a mana intensive recurring gain 4-9 life. Good, but not great. Equipment against Miracles are still amazing – they are our best asset against the deck, particularly Sword of Fire and Ice. Equipment against Pile is nearly a hindrance. We still get can free wins with it against Pile in certain situations however, so it’s still worth keeping. Pile in general gives Death & Taxes other problems I will go through later. 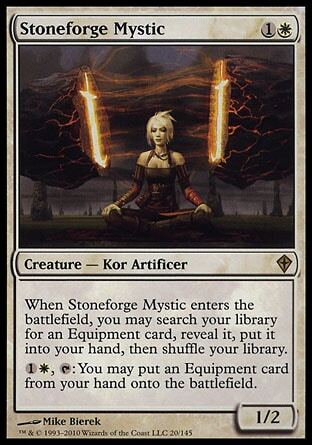 Nonetheless, looking at these few matchups our Stoneforge package no longer generates the free wins it used to. I’m not really going to mention why Elves is bad for us because that’s rather self-explanatory. But Elves becoming stronger due to the current midrange slugfest is certainly bad news for Death & Taxes. Pile is an interesting deck. Traditionally Death & Taxes was very good at grinding decks out. This was true because in the past decks like Miracles and Shardless generated value via cute interactions, such as CounterTop and Cascade. Pile need not do anything “cute” – they can just resolve their powerful spells (eg. Kolaghan’s Command) and their mana base is more stable than it seems. I actually feel it is much harder to attack Pile’s mana base than it is Delver. 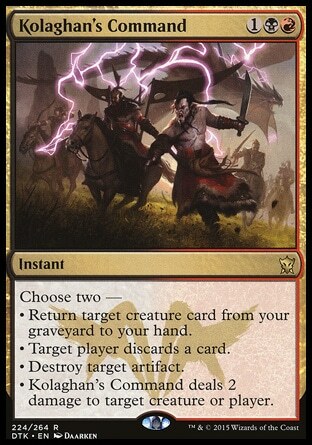 Originally, I saw Leovold as another Legacy, three-mana recurring draw a card when we bounce it continually with Karakas – not particularly efficient. Which I initially didn’t think was that good against us. However most of Death & Taxes can’t attack into a Leovold and it importantly shuts down our Ports. A solution to this problem is to increase the number of Spirit of the Labyrinth in your deck, perhaps to between one to three. Spirit can attack into a Leovold, makes Baleful Stix worse and allows you to still Port them with Leovold in play. Death & Taxes can surprisingly struggle to deny Pile’s mana; hence they just cast powerful spells and crush us. 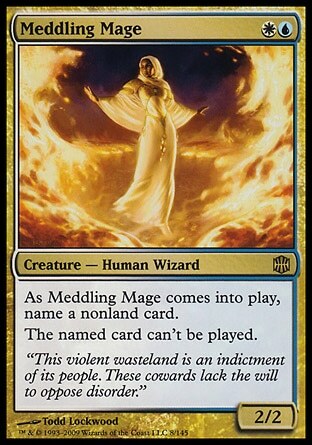 Our traditional mana denial isn’t strong enough in the face of Deathrite and a high land count and our Vials don’t last forever because of cards like Command and Decay – and hence we need to spend time casting creatures rather than denying mana. Hence, I believe we need to increase our mana denial aspects. This has given rise to Cataclysm and Armageddon in many people’s sideboard. However, I don’t think these are the solution. Without so many Dread of Nights around Spirit returning to the metagame is very important. 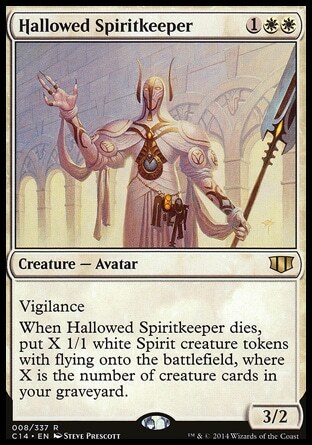 Spirit is a two-mana 3/1 beater that shuts down cantrips, which are of course a great proportion of the metagame. It increases our Game 1 vs Elves. It allows you to Karakas/Port Leovold decks without repercussions. It’s also a very quick clock, and Death & Taxes needs more cards that turn sideways efficiently, at least on an empty board. 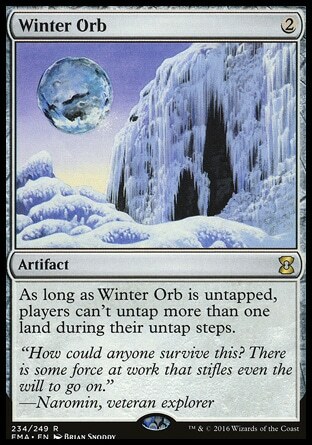 Winter Orb heavily punishes Pile for playing its greedy mana base; it also prevents them from killing our Vials/equipment as Winter Orb is easily a higher priority. Even without Vial a turn 1 Mom, turn 2 Thalia, turn 3 Mirran into turn 4 Winter Orb is a back breaking curve. Winter Orb also doesn’t get stuck in hand like Cataclysm does and get easily discarded. The main plan of Winter Orb is to jam threats early, cast Winter Orb and function like a classic White Weenie deck. I have of course tried to get people to stop calling Death & Taxes a White Weenie deck, but in the current metagame I feel it is actually time to embrace the White Weenie tag and turn sideways in certain matchups. It can also work well with Port, allowing you to untap port play a land and basically nullify their untap step. With Thalia, this becomes incredibly potent. Don’t underestimate this card. It can singly turn a game in your favour. It’s one of the few cards you can Vial in response to a Deluge and be happy. Can my opponent deal with eight 1/1 flyers? After already burning their wrath, the answer is probably no. It also has Vigilance which makes it a good equipment holder. It also trades with Leovold and is happy to attack every turn. You opponents will not block most of the time because they don’t want it to die, so sometimes it might as well read unblockable. For the same reasons it’s also a great blocker. I understand I’m committing a sin by going down to twenty-two lands, especially since I hate cutting White sources. I’m honestly not sure if you should be playing eleven Plains and three Ports, however I think the creature base here is perfect and the only other thing I could think of is playing a sixty-one card deck. The idea of this version is to redefine the prison and aim to take people out in the ways I mentioned above. Note that the extra creature density you obtain by cutting a Plains and a Batterskull is very nice. 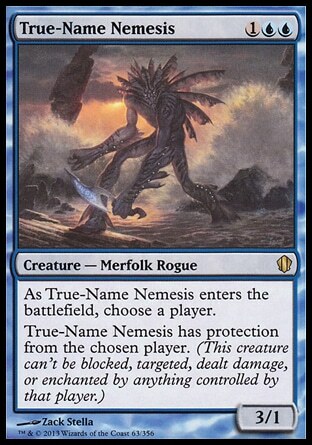 While splashing blue is a huge issue for the mana base, it gives us access to powerful Death & taxes creatures such as Vendilion Clique and True-Name Nemesis. Stifle itsself gives us access to many free win games against Tier 1 decks. Being able to Stifle the turn 1 fetch land, play a turn 2 Thalia followed by a Wasteland is utterly back-breaking. By amping up the mana denial, you can prevent people from playing derpy, expensive, powerful spells. 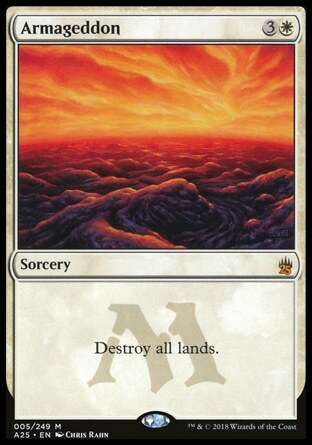 The ability to tax peoples mana and gain a lot of free wins was a critical part of Death & Taxes, which we have recently lost. Stifle let’s us regain this. There is also a great many other Stifle targets in Legacy; I have won a lot of games by just using Stifle a key ability. I won’t mention all the good Stifle targets, there’s countless. This doesn’t require much explanation: it’s hard to deal with and takes games easily by itself. It is easily one of the most efficient beaters in the entirety of the game. 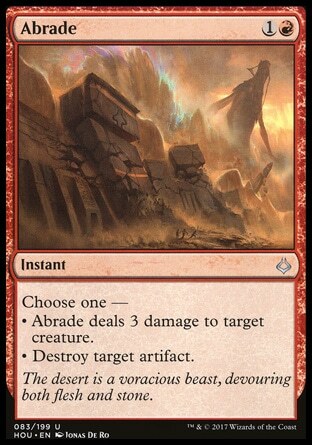 This is a monster of a free win generator especially with heavily mana denial produced off Stifle, Wasteland and Port. Flyers are just good in Legacy. A flyer with flash is even better. A flyer that exiles a spell is great. Spell Queller gives you a lot of good things and a lot of cute tricks. 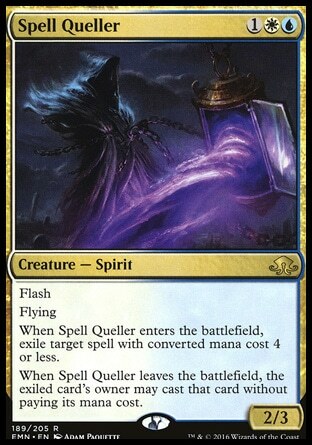 Back when I had a 2/2 split with Flickerwisp, you could wait for the opponent to tap out and flicker Spell Queller. Seems weird, but with Thalia in play they cannot pay 1 to cast the spell. Allowing you to permanently exile a spell. Even if they manage to kill the Queller you can potentially vial in a Thalia to stop them casting the spell. It’s just a real nice addition to the deck with lots of utility. Since we’re talking about free wins, I hear naming Tendrils of Agony against Storm is really good Game 1. Meddling Mage gives you a great number of free wins against combo decks. That said this variant has a lot of game vs combo anyway, but naming Kolaghan’s Command or Baleful Strix against Pile is never a bad thing. A basic bear with an upside is what Death & Taxes likes, and Meddling Mage is probably in the Top 5 hatebears of all time. 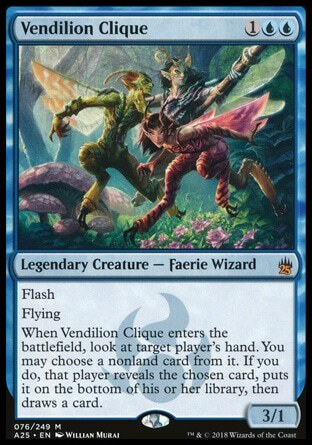 You can also do some cool things like Vial it in response to a Miracle trigger and name that Miracle card. These both are here to exploit with Karakas, but both give you a lot of free wins alone. If a Storm player casts a LED after chaining rituals you can respond to the led, by Cliquing their hand and bottoming the likely Tutor or PiF in hand. It can also rip cards out of players hands in response to Show and Tell and Vial/Stoneforge activations. 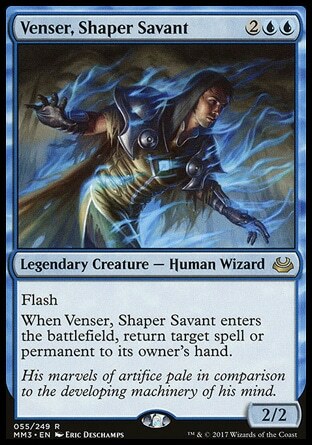 Venser just gives you a cute but efficient lock vs. midrange decks with Karakas (Editor’s note: I guess it has a similar role to Mangara or Pia and Kiran Nalaar!). This list generally has better matchups across the board. 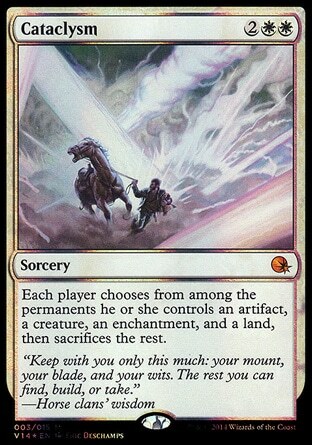 The access to Flusterstorms in the sideboard gives you such an oppressive game vs. combo decks. The extra tempo and superior clock of the mainboard allows you to crush unsuspecting players who don’t except to be Stifled from Death & Taxes. The Elves match up is worse without Stoneforge, but it was already pretty terrible. The three Paths in the sideboard are there just to crush Delver without the Stoneforge package. I experimented with a 2/2 split of Queller and Flickerwisp but found the mana base too hard to manage for a reasonable player. Managing the mana base is the hardest part of this list: it’s also the biggest problem with it. The best way to manage the mana base is against more aggressive deck is to use Stifle defensively to protect your own Tundras, though on the play you can typically do it aggressively. Your’e mostly always happy to play the mana denial game with Delver anyway. Unless they have the multiple Delver hands you tend to win, and you have three Paths in the side for this reason. The Dragon Stompy match up is also worse due to weakness to Moon, but do remember we still play Vials. I will personally be playing one of these two variants at Eternal Masters 2018 Melbourne and I strongly recommend every other Death & Taxes player to at least try these lists out before Masters. I do believe if you wish to win with Death & Taxes in the Melbourne metagame these are the decks that best achieve it.